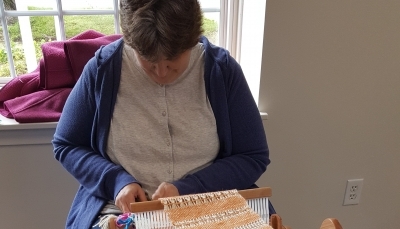 This weekend I was at Madison Wool in Madison, Connecticut teaching rigid heddle weaving on Saturday and inkle loom on Sunday. Mad Wool, as it is affectionately known, is an indie yarn and fiber shop owned by my friend Dayna Mankowski. It is a fun and unique shop with a spectacular display of handspun art yarn! Absolutely worth the visit if you are heading down to the shoreline of Connecticut. Teaching at Mad Wool is always a learning experience for me and I hope for the students too, even if they learn what they don’t want to do. Dayna has taken additional space which is bright and open and excellent for teaching. Before class we introduce ourselves and speaking a bit about why we are taking the class. In today’s inkle loom class there was a fiber artist, Doreen, who repurposes vintage clothing for clients. So, if you have an old coat she will redesign it, jazz it up, add embellishments and make a new piece that fits your style and personality. What fun! The inkle loom affords her the ability to create unique and one of a kind bands, edgings, straps, panels, loops etc. to use in her work. Stay tuned, we hope to have some of her work in retail shop soon.